← Service with a sneeze. 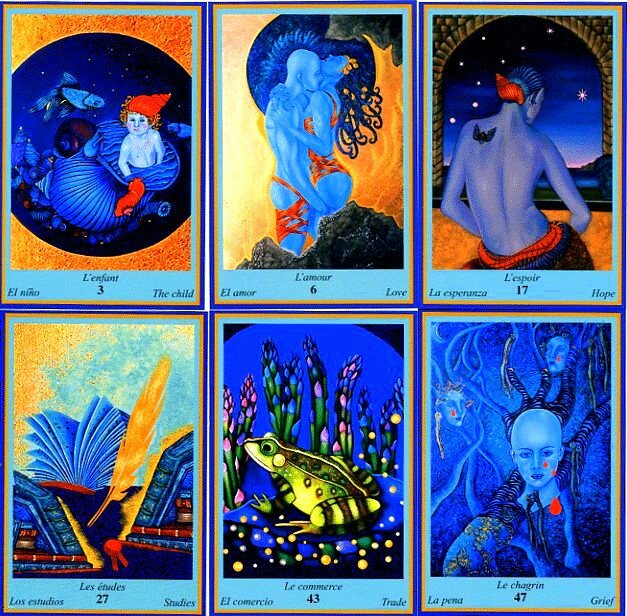 There’s been a mad proliferation of Tarot Decks out there, probably because so many people are desperately looking for answers that opportunistic publishers see it as a rapidly expanding market for a relatively expensive item. Also, there are so many excellent artists out there, desperate for work in this terrible economy, that they can be easily persuaded to work for what often amounts to less than minimum wage- so the publishers are making out like bandits, turning a time of scarcity into very rich pickings indeed. Much as I hate the fact that this kind of exploitation is going on, I have to say that some of the most gorgeous work is floating around out there. Desperation can be a powerful prod to creativity, and I’ve seen some of the most incredible new decks that really made my eyes pop with desire for yet more new cards. I have the collector’s lust- or rather, it has me! And I’m drooling over these two stunning selections I’m about to post here. As much as I adore color, these mostly black and white cards really captured my interest. 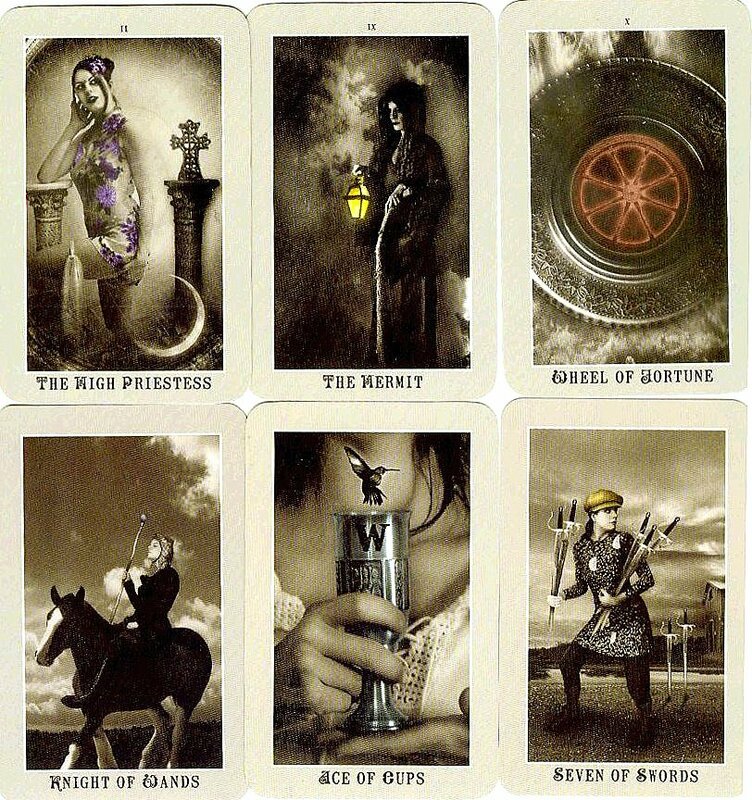 These are called the “Silver Era Tarot“, and they have a certain anachronistic charm. I’m reminded of the old time photography booths, and the photo-coloring that was so in vogue in the ’80s. The artist is Aunia Kahn, and they are available in the US and online. They come with an accompanying book by Russell J. Moon. Apparently the Artist, Aunia Kahn, has used herself as the model in all of the cards that do not specifically portray male role models. That provides a certain continuity if one considers the allegorical “Fool’s Journey”. While not obviously created in a SteamPunk style, there are still suggestions of this aesthetic sense, oddly combined with a Renaissance Faire Flavor. On the whole, this is a very tasty offering, and I think I’m going to have to have these at some point. Anyway, I thought all you Tarot Fans out there would enjoy seeing a sample of these delicious new goodies. I have to thank Lynn Whitlark, who posted pics of these in her wonderful blog “WELCOME TO THE SEVEN HOUSE” back in 2010. As always, relevant comments are encouraged and welcomed. This entry was posted in Allegorical Fool's Journey, archetypes, black & white photography, cartomancy, Divination, french tarot cards, Major Arcana, Metaphysical, photo coloring, Silver Era Tarot, Spiritual, Steam Punk, tarot, tarot deck collectors, tarotcircle, underwater fantasy themes in art, unusual new tarot decks and tagged Aunia Kahn, black & white photography, Cartomancy, Divination, France, Religion and Spirituality, Silver Era Tarot, SteamPunk, Tarot, tarot collectors, unusual tarot decks. Bookmark the permalink.